US destroyers in the Gulf of Aden launched airstrikes against Houthi rebels, a Shia insurgent group currently withstanding a massive bombing campaign from a Saudi-led coalition in a year-and-half conflict between largely Shia rebels and the Saudi-backed Sunni government in Yemen. The Pentagon insisted that cruise missiles had been fired onto the USS Mason on Sunday and Wednesday from Houthi-controlled territory, and called the airstrikes a “limited self-defense” response. 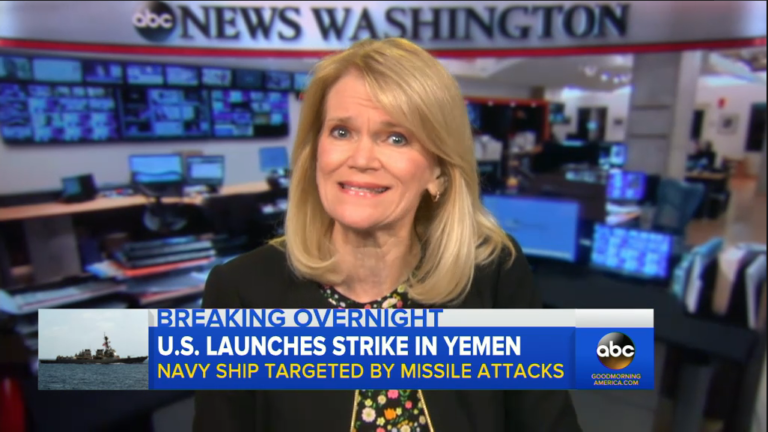 ABC’s Martha Raddatz (Good Morning America,10/13/16) likewise didn’t inform the viewer that the US has been a party to the civil war for 18 months. She also never used the word “Saudi” or referred to the brutal bombing campaign; she barely even alluded to there being a conflict at all.